The exclusively marine phylum Echinodermata includes the starfish, sea urchins, sand dollars, sea cucumbers, crinoids and some strange forms that lack any apparent symmetry or recognizable shape. The first members of the phylum appeared near the start of the Cambrian period, and they are now found at every ocean depth, from the intertidal zone to the abyss. With about 7,000 living species, they are the largest aquatic phylum that has no freshwater or terrestrial representatives. Their name is derived from "spiny skinned animals" because of the ubiquitous skeletal plates just below their leathery integument. Two main subdivisions of Echinoderms are recognized: the ambulatory Eleutherozoa and the sessile Pelmatazoa. The first encompasses the Asteroidea (starfish), Ophiuroidea (brittle stars), Echinoidea (sea urchins and sand dollars) and Holothuroidea (sea cucumbers). The second includes crinoids and extinct Paracrinoids, though some crinoids known as feather stars have re-acquired a free-floating lifestyle. Echinoderm larvae are ciliated, free-swimming organisms that look like embryonic chordates. The phylum is characterized by a watery vascular system and five-fold symmetry. In some cases, this has been superimposed with bilateral symmetry. When the skeletal plates are fused together, as in the sea urchins and sand dollars, their preservation potential is high and these animals have left an excellent fossil record. In the other cases, the plates disarticulate upon death of the animal so intact starfish and crinoids are rare in the fossil record. 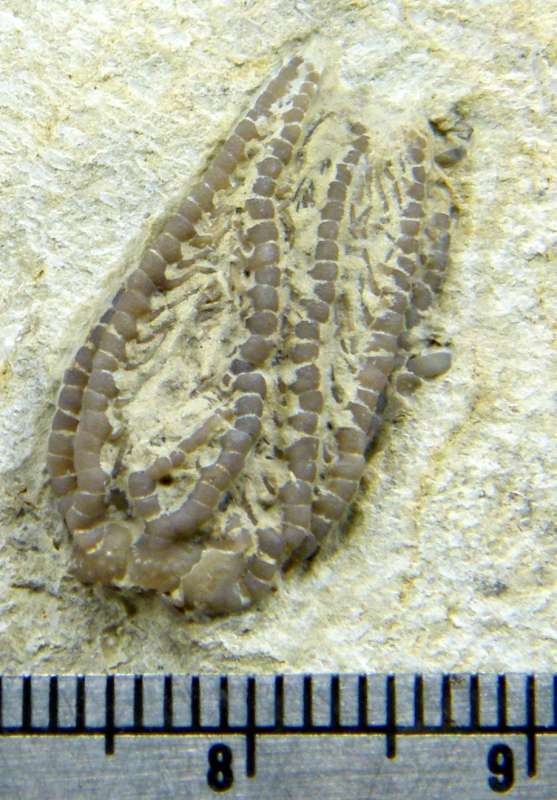 Crinoid stalks and their individual column disks are the most common fossil echinoderms at Black Cat Mountain. However, it is also possible to find remains of their calyces, or bulbs, occasionally articulated, but most of the time as individual plates. Cystoids and starfish have also been found, though the latter are truly rare and require a lot of patience to find. 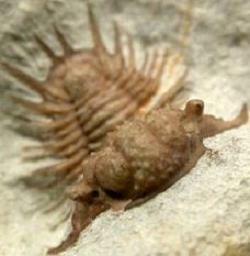 The specimen in the photograph below, found in the Haragan and partially cleaned in September 2010 by Bob Carroll, has not yet been found in Stremple's monograph on the Hunton crinoids. Another interesting un-named specimen shown me on a trip to Bob Carroll's shop in early January 2011 is the little crinoid head structure shown in the image below. 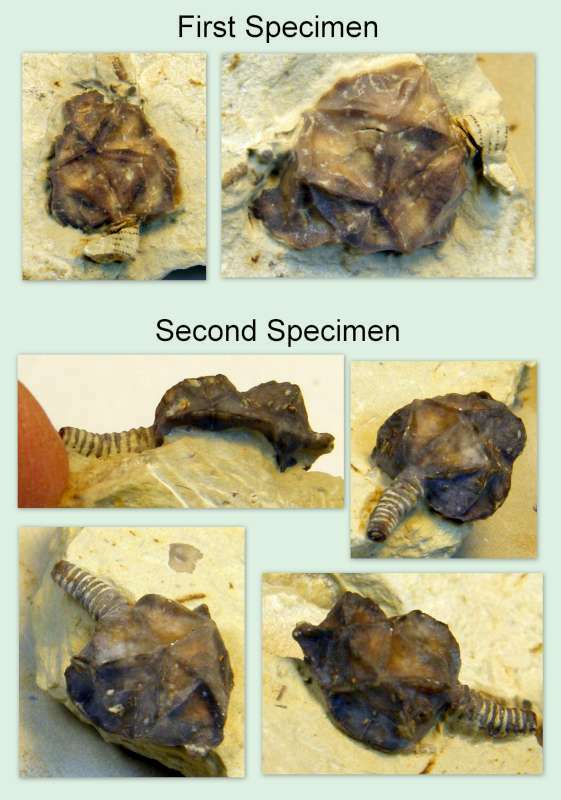 Below is a collage of photographs of two specimens of a recumbant cystoid, recently described in the paper "New Recumbent Echinoderm Genera from the Bois d'Arc Formation: Lower Devonian (Lochkovian)," Parsley and Sumrall, Journal of Paleontology.2007; 81: 1486-1493. These are the same specimens shown in the book Trilobites of Black Cat Mountain, but with additional views to show the overall structure. 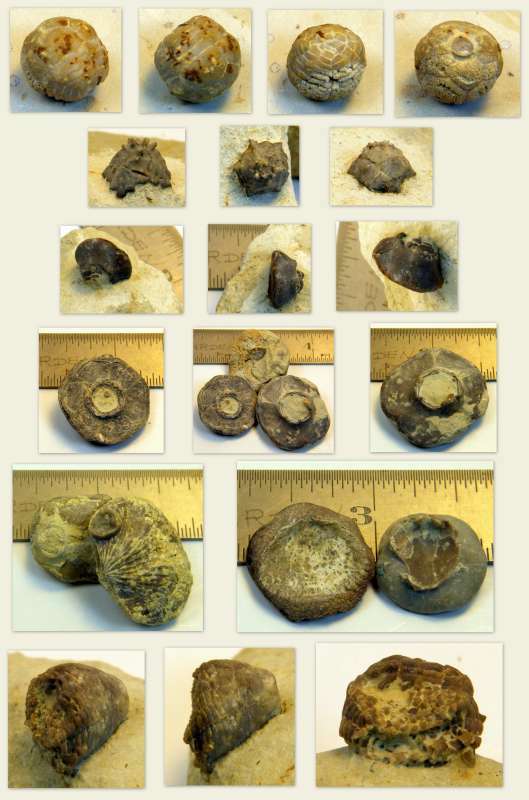 Several different species of crinoid calyces have been found by Bill Rushlau, as shown in the collage below. These tend to be small, less than a quarter dollar in overall dimension. Some of these were free-floating during part of their life cycle, others preferred to attach directly to the shells of brachiopods, possibly as a way to take advantage of the current streams created by the lophophore of the host. I will add more on the details of these species as their taxonomies and ecologies are uncovered either by Bill or me. Starfish are rare at Black Cat Mountain, but they have been found. In the collage below (upper left) is the specimen of a species of Salteraster illustrated in the book. 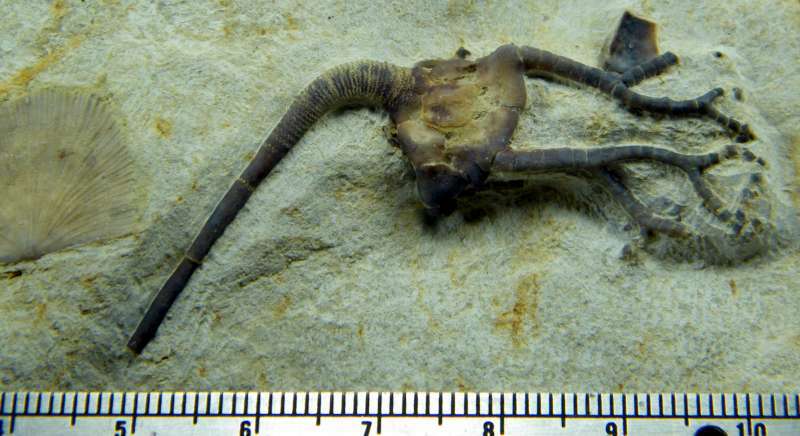 This specimen is about 12 mm across the tips of the arms. The second row shows a likely starfish which left an impression on the mold of a clam. To the left is the whole fossil, to the right is an expanded view of the starfish itself. This starfish fossil is less than 5 mm across. 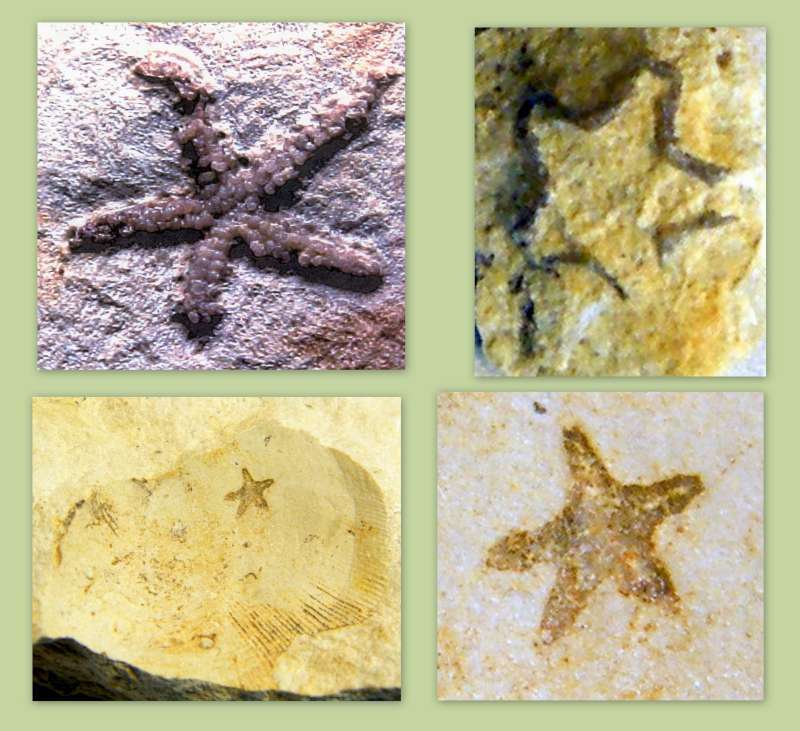 The image in the upper right corner shows another tiny fossil also shaped like a starfish, but more information is needed to avoid an ambiguous assignment. Refer to the image in the book for the information on the Salteraster. Bill Rushlau found the other two specimens.